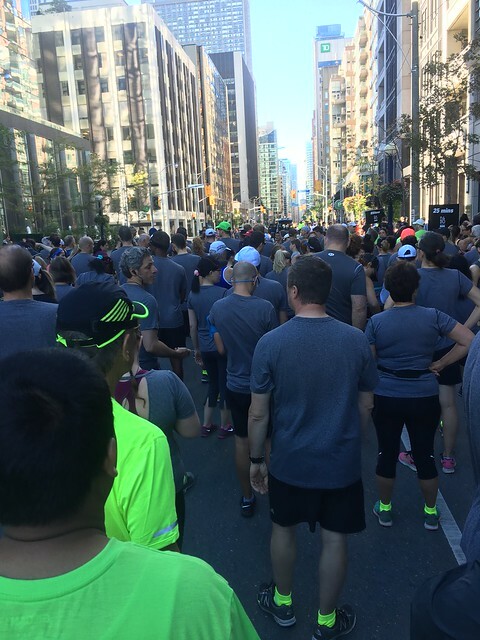 The Yorkville Run 5k is a pricier race but you truly do get what you pay for. Sunday marked my third time running it and I was not disappointed. Packet pick up was quick and seamless, with volunteers wearing tuxedo t-shirts. Instead of having a pick up desk you just walked up to a volunteer with a clipboard and signed for your kit while another volunteer went and got it for you. It was like the Apple store only not chaotic. This year’s awesome race kit. They put it all in the little tube that had a string handle. It was really nice to carry home (not bulky and really light and organized). 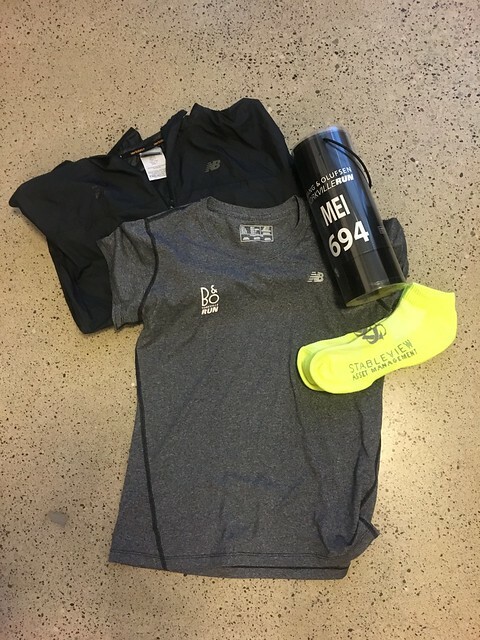 This year’s race kit included a New Balance jacket, New Balance tech t-shirt, $50 off coupon to a spa and some socks. This is the one race where I make the exception and wear the race shirt on race day. They always have a draw for people wearing the shirt (and this year the socks as well) and the prizes are just too good to pass up. On race day I got up early and ran to the start. It’s approximately 5k from where I live and I needed to get 23k in for my marathon training so I made every kilometre count. I made it in time to watch the Canadian 5k Road Race Championship. I love watching the 5k racers. They’re all so fast and everybody looks like they’re going to die by the looks of pain and angst on their faces. I love watching them give it their all and leave everything on the race course. 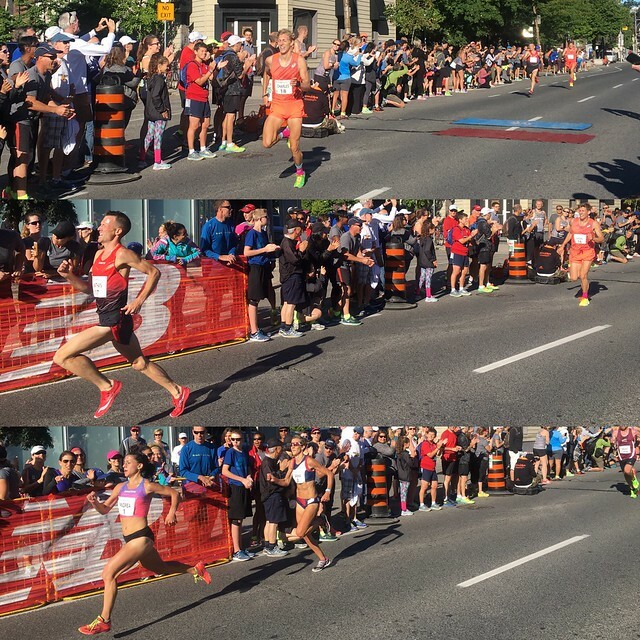 Charles Philibert-Thiboutot set a new 5k record on Canadian soil by finishing in 14:04.6. The announcer had us all practice saying his last name as we waited for the runners to round the last corner. Then I watched in awe as he blazed by. Pure determination. The fastest woman on the course was Andrea Seccafien who finished in 16:10.8. She was also amazing. Then I stayed and watched all of the runners to the end and I cheered for them. Some of the runners made me want to cry. 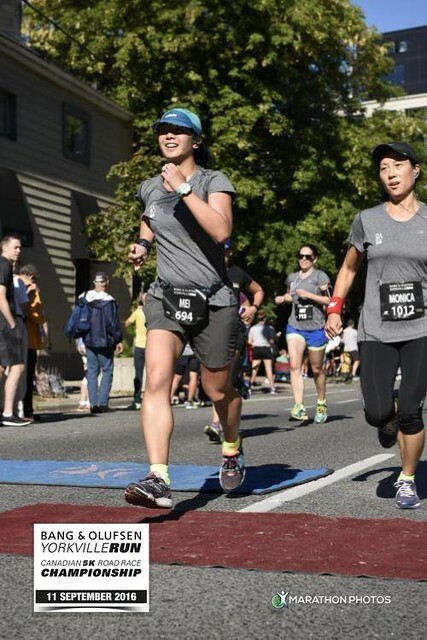 I felt so inspired seeing the pained looks on their faces as they approached the finish line and how some of them would pick up the pace as we started cheering. It was incredible. After the championship it was time for the regular runners (like me) to line up in our corrals. I lined up in between the 30 minute and 25 minute signs. My first kilometre was pure adrenaline. I always start too fast and it was also downhill so I ended up running it in 5 minutes flat (this is extremely fast for me). My second kilometre was about 5:15. As usual, kilometre 3 was my worst one. We hit a headwind and had a slight uphill, which didn’t help but I know for me it’s mental. There’s something about that third kilometre that just zaps the determination out of me. I remember glancing at my watch and thinking “The winners of the 5k were done runing by now.” Right after the 3k marker there was a water station. 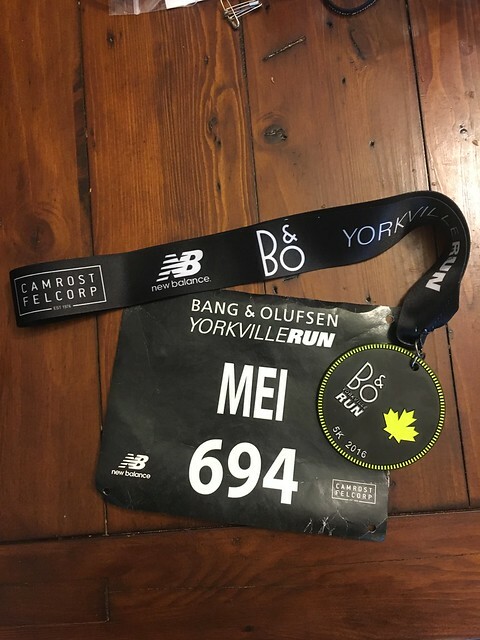 It was hotter than I thought it would be and knowing that I wasn’t going to PB (I was thinking of this race as some speedwork in the middle of my long run) I stopped for some water. I took a moment and then started running again, which made kilometre 4 my second slowest kilometre. As I got closer to the ROM I looked to my right and saw Leanne. We said hello and I told her “I don’t like 5ks.” A woman ahead of us who I had been following for a while turned and said “5k feels like forever!” A little boy who was running by tripped and fell and we stopped to see if he was hurt but he bounced right back up and continued running. I blinked and he was gone. 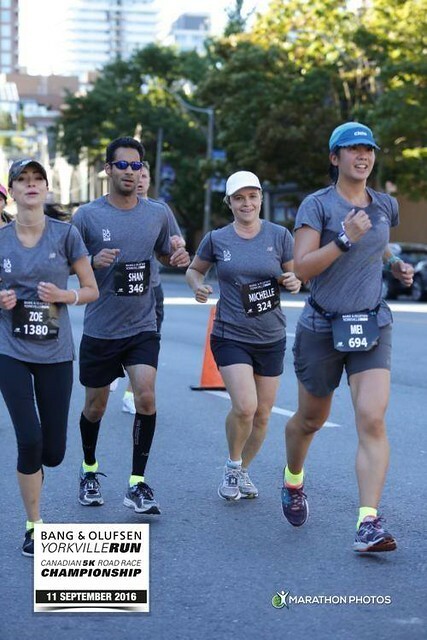 As we headed past the ROM I found a little bit more in me and started pushing again. I knew we were going to turn right up ahead and that I just had to hold on. When we turned onto Davenport I pushed even harder and visualized the finish line. There was a woman who I’d been running neck and neck with for a while. As I started to run faster I managed to get ahead of her. We rounded the corner and I could see the finish line, but I also felt really sick at the same time. I saw Dan and I waved and started pushing the pace as hard as I could. Part of me wanted to pass out, part of me wanted to puke, all of me wanted to stop running but I knew I just had to hold on a little longer. I crossed the finish line and almost puked. I felt something rising up from my stomach but I managed to keep it together. It was close. A volunteer handed me a medal and I stood for a long time catching my breath. 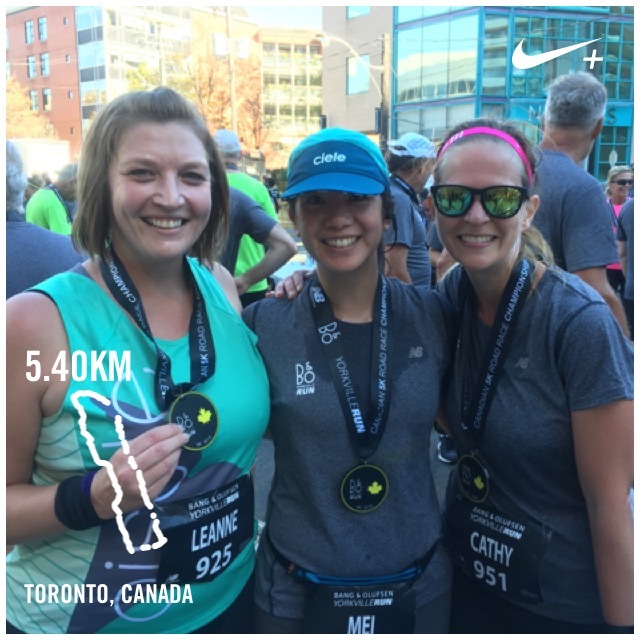 My last kilometre was a 5:12, so I was pretty proud of finishing strong. That’s fast for me and usually my last kilometre in a 5k is nowhere near that. I finished in 27:16, which was nowhere close to a PB and actually even 10 seconds slower than last year, but I was happy with the result. This summer has been so hot and all of my training runs have felt really long and heavy (as in 5+ hours to run 32k). I wasn’t sure if i had any speed left in me, so I was glad to get somewhere close to what I did last year. 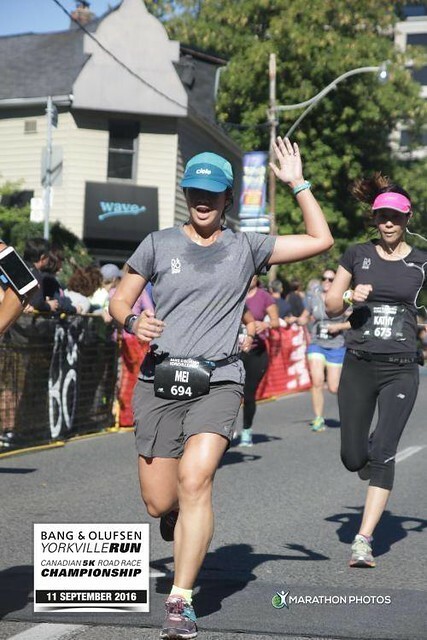 Another perk of the race is that you get free race pictures! Mine were all taken in the final stretch heading to the finish line. You can tell how hot I was by how sweaty I look! What excites me about these pictures is that in some of them I look like I’m running and both my feet are actually off the ground at the same time! I picked up some water and then ran into Lauren from RunToBeer. We chatted for a while and then I went to get Nuun and ran into Leanne who was talking to Cathy. Next, Dan and I headed to the post-race celebrations area where I lined up and picked up all of my food. One of the reasons why I keep running this race is for the incredible cinnamon buns. I had to have my cinnamon bun! 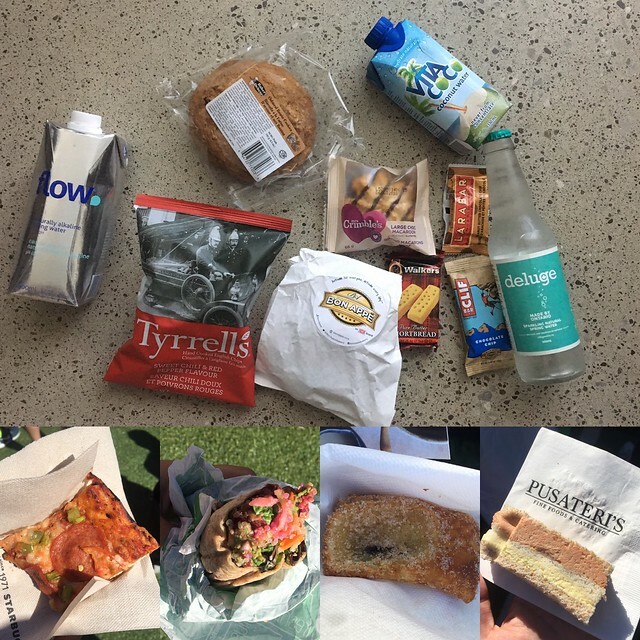 They were out of coffee by the time I got to the food station (and a few other goodies), so that may be more incentive to run faster next time? Dan and I stuck around to watch the speeches, awards and prize draws. Usually I also raise money for the YWCA when I run this event but I didn’t get my act together this year. I’m hoping to raise money for them next year.It will make munching on my finish line cinnamon bun all the more satisfying. A final look at this year’s medal. Great recap! This race has always been one that i’d like to do one time! Thanks Mike! You should totally run this one day! 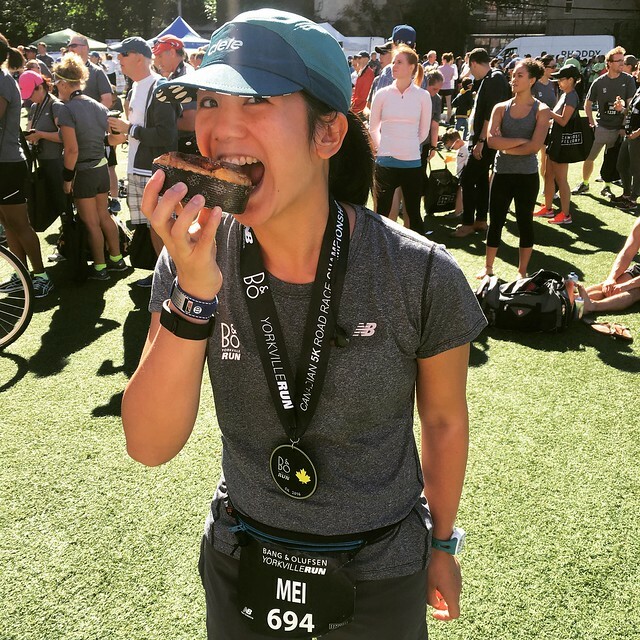 It’s pricier but the food and race kit are good (and it’s for a good cause too! ).